I've been transcribing some Django tunes (thinking how Django might have played them with 2 fingers). Posting here for 2 reasons, to share and hopefully fix any errors. If there's anything that anyone might notice, just create a track on the same page with the fix in the right spot, and I'll edit mine! I'll dig through the search results for some more as well, don't want to reinvent the wheel! 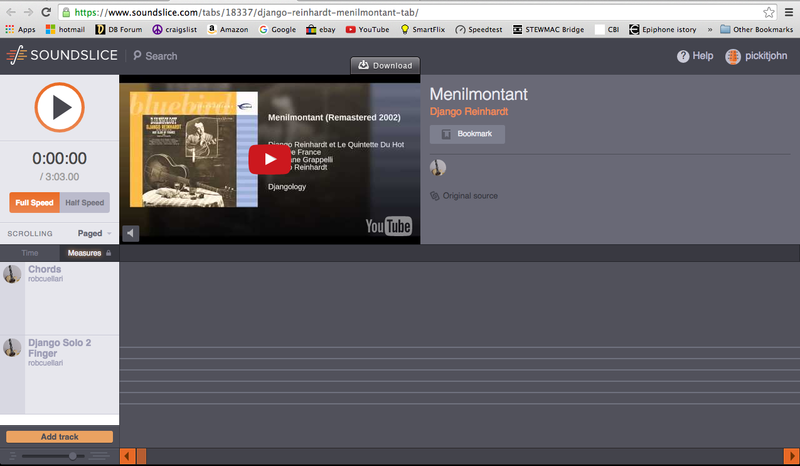 Also if there's any tunes that someone really wants transcribed (Django tunes only for now), I'll give it a shot. Just lemme know! Lady be Good and I'm Confessin' would be great! sophisticated lady and La mer (far beyond the sea) would be cool! i haven't been too active on here, but i've had some time off from work. looking to knock a few of these off - hopefully these are ones that aren't easy to find online already. @pickitjohn From Rob's link, click browse on the top banner. On Macbook there is no completed in the top banner ?? ?